Navigate through your Organizer or switch the view to Day, Week, Month, Year or Timeline. One of those views can be set up to default view. Click Day, Week, Month, Year or Timeline to access the corresponding view. In each view, you can click Today to go to the current date. The weekly view is selected by default. You can change the default view in the organizer settings. The arrow buttons in each view allow you to skip back or ahead. 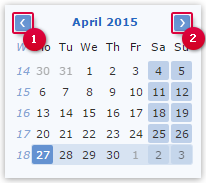 Using the date navigator, you can always get an overview of the selected month. It displays a month with numbered weeks. The current day is shown with a border. The current week is highlighted in light blue. You can use the arrow buttons (1) and (2) to skip to the previous or next month.